When I got my PhidgetSBC3 I was really excited because I was going to try to get go running on it ([which I did](/2013/03/go-on-the-phidgetsbc3-part-1/)) but while it recognized my [Logitech Z205 speakers](http://www.amazon.com/Logitech-984-000108-Laptop-Speaker-Z205/dp/B0036VO6IC), playing any audio file resulted in a lot of crackling ([hear for yourself](http://f.cl.ly/items/2H0B2Y450Q2I1U1Z2d13/Memo.m4a)). After searching until my eyes bled months ago, I gave up. But recently I took another stab (because I want our foosball table horn back at Shopify) and finally found a solution then I figured out the actual problem. I’ve tried solution after solution hoping it would work because none of the regular troubleshooting would work as the device was being recognized and was able to be used. It just sounded horrible. I did find [this wiki entry for archlinux for crackling sound with USB devices](https://wiki.archlinux.org/index.php/Advanced_Linux_Sound_Architecture#Crackling_sound_with_USB_devices) but that solution didn’t help. But did make me try restarting the PhidgetSBC3 which then lead some actual errors when trying to use alsa. Searching for this lead me to [this forum post about a usb speaker not being detected](http://forum.doozan.com/read.php?2,2449) and suggested creating a `/etc/asound.conf` file and restarting alsa. This solved the problem of not finding the device and the crackling. The `card 1` in the file suggested an ID of some sort and then I checked the ID of the device and found it matched. I wanted to confirm this was the device missing issue so I restored to factory and plugged the Z205 in and looked again. And suddenly it makes sense. For whatever reason, before installing `alsa-base` the PhidgetSBC3 will use ID 0 for the Z205 but after that it will use ID 1. I have no idea why the crackling went away but it might have something to do with setting `type hw` or maybe it just doesn’t like ID 0. If you’re trying to get sound on the PhidgetSBC3 to work. Try this and restart. [ ok ] Shutting down ALSA…done. [ ok ] Setting up ALSA…done. Now that go is installed ([see Part 1](/2013/03/go-on-the-phidgetsbc3-part-1/)), you can get down to business and start using phidgets. I’ve written a go phidgets library (currently only `InterfaceKit` and `IR` phidgets are implemented, open an issue or pull request if you want more) at [github.com/samuelkadolph/go/phidgets](https://github.com/samuelkadolph/go/tree/master/phidgets). “The Go Language Gophers” team](https://launchpad.net/~gophers/+archive/go) I downloaded the `golang-tip` package and built it on my PhidgetSBC3. I’ve made this `deb` available in my apt repository so you can easily install go and get rocking. This is because perl is very vocal when you are missing the locales that your environment specifies. The fix is easy, just generate the locales that you want to use (`en_CA.UTF-8` is the default). 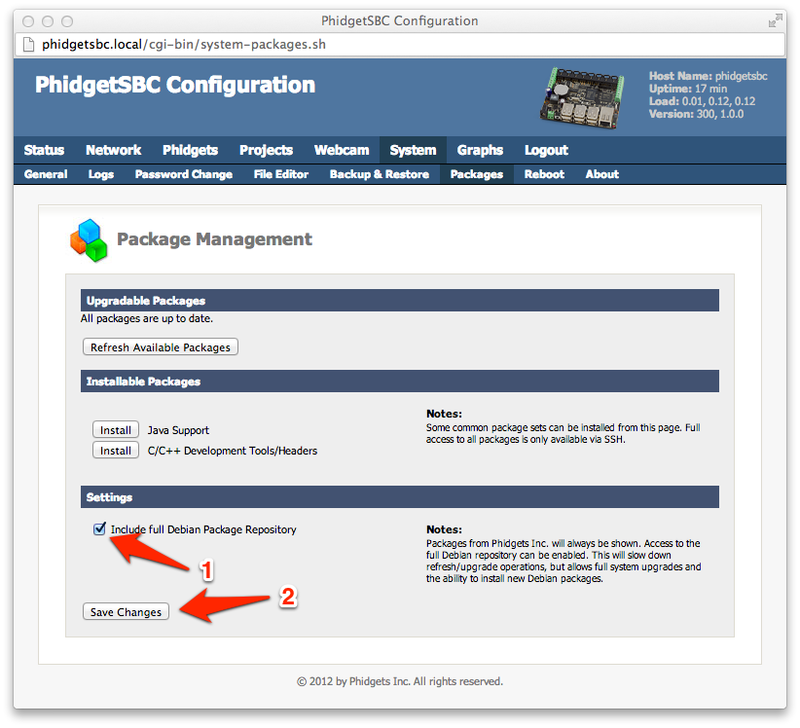 This assumes you have already set up SSH on your PhidgetSBC3. You should see it generating the locale you specified and once it’s done, you will no longer see the locale error messages. > There’s actually a much easier way of doing this. Just `apt-get install firmware-linux-free` and boom! You get the carl9170 firmware and the DWA-160 is recognized.